If you are here I guess that you have the yips. There is a way out of this problem. You can start by signing up for my cures for the chipping yips. I will send you some great information and techniques to cure your yips at no cost. 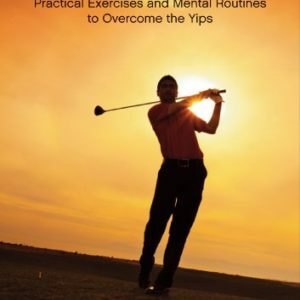 Over the last 15 years, I have helped more and more amateur and professional golfers to overcome the yips. The pros mind is the same as yours. In fact it is true to say that in many ways, we all share the same mind. The good news is you can recondition your mind to cure the chipping yips the same way that so many of my clients have. You may be surprised to learn about the true cause of your chipping yips. No, what causes the chipping yips is you. Your very own mind has become conditioned to respond in this way when you play your chips. Isn’t this why when you are feeling relaxed, perhaps practicing alone, your yip can be less severe? In short, the answer to the question “What are the yips” is the yips are a physical manifestation of mental interference. A debate goes on among sports psychologists and sports scientists about the different types of Yips. Emotional and Physical. The Mayo Clinic defines “The Yips” as a “psycho-neuromuscular problem that often occurs in golf (especially during putting and chipping) when the golfer experiences freezing, jerking, or a tremor prior to initiating a putt or chip.” “Psycho-neuromuscular” simply means that the mind controls the muscles. It is not a disease at all but more like a phobia that develops and then becomes a habitual state of mind. In simple terms, (emotional) Yips is a manifestation of fear. Fear of hitting a bad shot, fear of embarrassment, fear of scoring a high number and fear of “yipping”. The flip side to this fear is craving. Really wanting to do well, craving success, wanting to look good, craving a putt that doesn’t involve yipping. This flip side is often overlooked but is critical for you to understand how your mind works. Your body’s natural defenses are designed to keep you away from the things you fear, via a mechanism called the “Fight or Flight Response”. 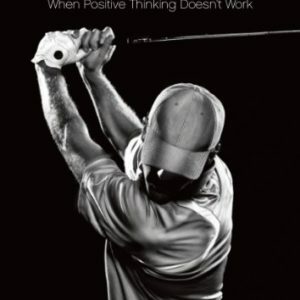 You have conditioned your mind to respond in this way on the golf course and your body responds accordingly. The second type of Yips is the (physical) Yips caused by a neurological disorder called focal dystonia. In this case, when fine motor movements are practiced over and over again a disorder can develop which causes the muscles to cramp at critical moments. Many musicians have been known to have this type of yips. To my mind Emotional Yips and Physical Yips are the same thing. Our mind has interfered with our bodies ability to perform. Emotions are felt in the body, physically. We must develop our minds ability to stay relaxed and concentrated once more. You must strengthen and condition your mind to remain calm and concentrated when you play these shots. You also need to change your attitude toward them. If you work on these two things together, you will find out how to cure the chipping yips. With practice, patience and persistence you are bound to be successful in overcoming the chipping yips. For a package that includes my book, the videos and one to one coaching, click here. Did you ever spend time agonizing over a problem and desperately trying to force your mind to come up with a solution? Then leaving the problem alone and doing something completely different the answer to your problem just comes to you. I’m sure we have all had moments like this. Well how do you explain it? Our brain has two semi-independent, largely separate mental systems. One has massive computing power and operates constantly, purring away in quiet to solve our problems, surprising us with a sudden solution to our problems. Since it operates beyond the horizon of conscious awareness we are blind to its workings. This system presents the fruit of its vast labours to us as if out of nowhere. Much of this systems neural wiring lies in the lower part of the brain, in sub cortical circuitry, though its efforts break into awareness by notifying our neo cortex, the brains topmost layers, from below. “Bottom up” has become the phrase of choice in cognitive science for such workings of this lower brain neural machinery. By the same token “top- down” refers to mental activity, mainly within the neo cortex, that can monitor and impose its goals on the sub cortical machinery. It’s as though two minds were at work. With the yips this top down circuitry has taken control and causes the chipping yips. 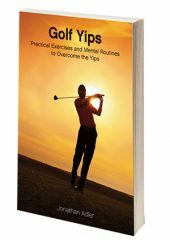 There is much more on the neuroscience behind the yips in my ebook . How to get rid of the yips? Developing your ability to focus and concentrate is essential. Imagine yourself performing a physical task that you are confident doing. Driving or walking or brushing your teeth. You are relaxed as you perform this skill, your mind is focused on something simple as your body moves naturally. A focused mind allows the body to perform as it knows how to. Currently before you play your chip shot you will be fearful of the outcome and begin a process whereby you try to control a part of the swing in order to get the outcome that you crave. Compare this with a part of the game where you feel comfortable and you will notice a big difference. You probably trust yourself and certainly do not try to over control the shot. Trying less and trusting more are the skills that you need to develop to get rid of your chipping yips. Your change of attitude will massively increase the chances of success. One to one Coaching with me is the quickest way to achieve this. Book a free 10 minute telephone chat with me for us to discuss how you can get rid of the yips. You can ask me any questions, i will give you some great chipping yips drills and if you feel comfortable, you are under absolutely no obligation, we can arrange some future coaching sessions by telephone or skype. Develop your ability to keep a calm and relaxed mind. Change your attitude toward your chipping yips. Stop over thinking the technique, it’s not the starting point. Be very patient with yourself and very persistent in your efforts. To find out how to achieve these 4 things, sign up for my Cures For The Chipping Yips course below in which I will also give you 2 great chipping yips drills. These drills are part of my program including my Overcome The Yips Video Series and for the quickest route out of your misery, one to one Coaching Calls with me. You have probably had your chipping yips for quite some time. So don’t be in a rush for a quick fix. There isn’t one. As a starter and for much more information on how to get rid of the yips and some great chipping yips drills read my book “Overcome The Yips”.